The Border Terrier is a breed that enjoys being part of a group versus being a loner. They are full of playful energy and enjoy being a dependable watchdog. Natural hunters, they enjoy roaming freely about an open space if permission is granted. They are easily trainable compared to other dogs and they can also get along well with other hounds. The Borders enjoy playing and residing with little ones and are adept at getting out of a trapped situations. They are great house dogs but do tend to dig if allowed. Some, but not all of them will bark on occasion, and they will also go after any small vermin or rodents that cross their paths. Border Terriers are somewhat friendly with strange people that may enter their homes and they also bode a high level of affection for their families as well. 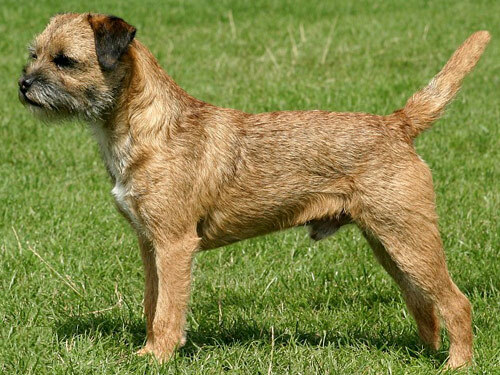 The Border Terrier is an active canine that will prefer a long walk or some time each day to run in an open field. While they prefer to live in an indoor environment and still have the freedom to get their daily activity requirements in, they can easily reside outside in virtually any climate without a challenge. They bode a harsh fur coat that will require some attention as far as grooming on a weekly basis is concerned. Dead hair stripping is also a common grooming practice for this breed. Luckily, the Border Terrier is a breed that does not possess many major health concerns. They can develop patellar luxation and some heart defects as they age. CHD is also commonly found in some Borders, but not all of them and no more than any other breed. The vet may suggest as time progresses for the Border Terrier to have their heart and jips screened regularly. The healthy average lifespan is from twelve to fifteen years long. They also weigh around eleven to sixteen pounds as full grown dogs. Some experts would agree the Border Terrier is one of the oldest recognized canines from the Scottish and English areas in the 17th century. The Cheviot Hills location is where they originated from, which was also known as the land that was the border between Scotland and England, hence the name "Border Terrier." Well known for hunting fox and rattling, they were a small dog with a lot of hunting potential and which is why they were frequently utilized to go along owners on fox hunts in the late 1800’s. They got their recognition by the AKC in 1930 and became a showing breed around 1870. While they did show well, they remained more of a favorite among the hunting population rather than the owners seeking exceptional show dogs. Known for their small size, but still with a feisty demeanor in hunting fox, they gained a reputation for being somewhat of a problem to the farmers that owned the land the Border Terriers would chase around. Currently, they are beginning to climb the popularity of dog show breeders with their otter face appearance similarities, making them a very unique looking canine.